Given the poor quality of the photos, this may be a hopeless cause. I figured it was worth a shot though. At worst, maybe I can narrow the possibilities down a little bit and learn something in the process. The two photos I got were both blurry and from some distance, but they do give some idea of the shape and shading of underparts. I was watching out the window as we were driving down the road when I first saw the bird, and I almost ignored it as a juvenile Bald Eagle. Something about it made me keep looking, and the more I looked the less certain I was with that identification. Initially it was fairly close, but between its flying and our driving, I had a hard time getting a good look because of the trees. We made it to a place with an open view, but by this time it was pretty far away. One thing that did stand out to me is it seemed to have its wings upward a bit. It was a slight ‘v’ shape, or maybe a ‘v’ with the tops flattened out just a little bit. I also remember seeing what seemed to be just a little bit of a rock back and forth as it was flying. 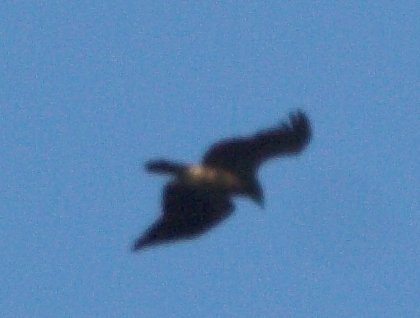 Looking through the books, it seems like it could possibly be a Golden Eagle, but they’re pretty unusual around here in general. I’ve only ever heard of them showing up during migration time, and this seems a bit late for Fall and early for Spring. 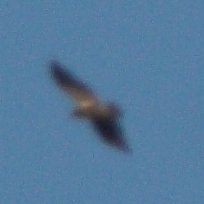 Hard to say, but the contrast between a dark body and a paler underwing (in the smaller flight photo)indicates that this bird is NOT likely a Golden Eagle; that species would show a dark underwing against a dark body; with immature birds showing a white area at the base of the primaries. Thanks for the help. I would not be surprised if this is a juvenile Bald Eagle, but it just didn’t seem quite right. I suppose it’s also possible that I misjudged the size of the bird and it’s something smaller than an eagle.